"The story of a man who was too proud to run." The marshal Will Kane has just married Amy Fowler, a Quaker who doesn’t believe in violence. The marshal has turned in his badge and plans to retire with his pacifist wife to another town in order to open up a shop. Just as Will and Amy are about to leave town, news arrives that Frank Miller, a criminal who Will arrested and who was released from prison on a technicality, is coming in on the noon train. Frank has sworn revenge against Will and the town people are eager to see Will leave so they can all avoid trouble. As the former marshal and his wife are driving off however, Will realizes not only will he never be safe if he doesn’t face Frank, but the town will be in danger as well. Against his wife’s protests he returns and reclaims his badge. It looks though as if Will will be outnumbered against the gang coming in on the noon train, as one by one the town people refuse to support him and all urge him to run away. The marshal stands truly alone, with even his wife not supporting his decision to stay and fight Miller. 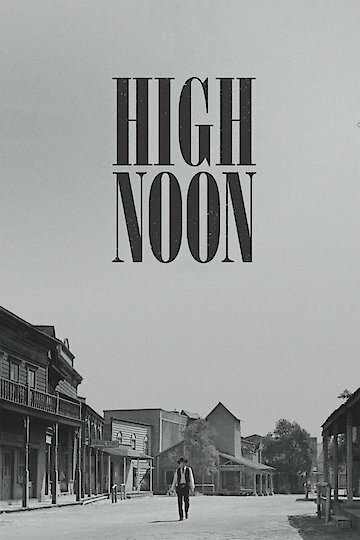 High Noon is currently available to watch free on Popcornflix and stream, download, buy on demand at Amazon Prime, Tribeca Shortlist, Sling, Amazon, Vudu, Google Play, FandangoNow, iTunes, YouTube VOD online.